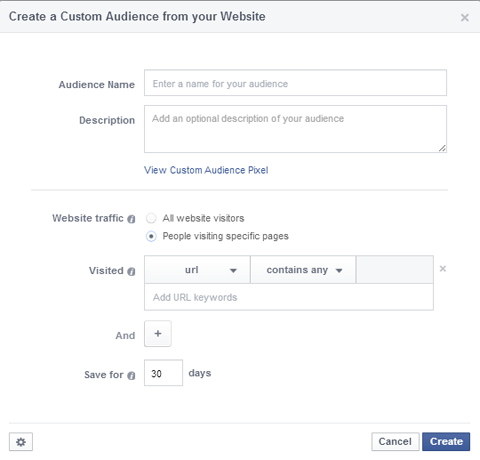 Retarget content to a your audience with Facebook Custom Audiences. The goal of retargeted content (also known as remarketing) is to place your brand top of mind. Common strategies remarket to people who have already visited your website. 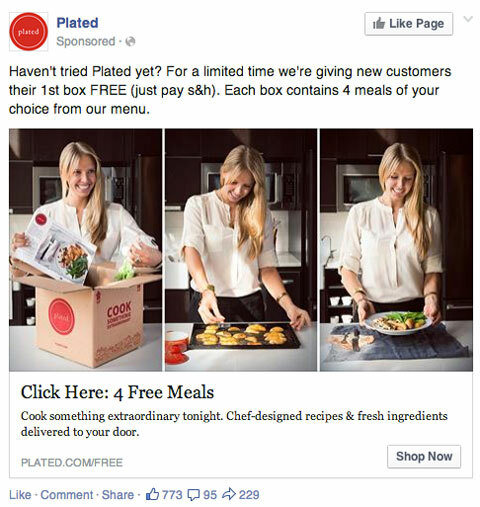 Updates like this can show up in your news feed if you’ve ever visited the Plated website. People rarely buy from you the first time they visit your site or see an offer. They would rather take their time, compare your pricing with competitors’ and visit your site a few more times before completing that valuable sale. 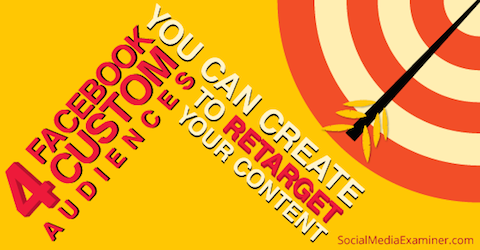 Here are four custom audiences you can use to retarget Facebook users with your content. The most common remarketing tactic is targeting relevant ads at people who have already visited your website (usually a specific landing page). To create a targeted audience based on website visitors, you must have a Facebook website custom audience in place. Overall, retargeting website visitors is a simple concept: When someone visits a page with your custom audience code (i.e., an offsite pixel), they’re added to your custom audience list in your Facebook Ads Manager. You can include those visitors (and the custom audience they’re part of) as a target audience in a Facebook ad retargeting campaign. 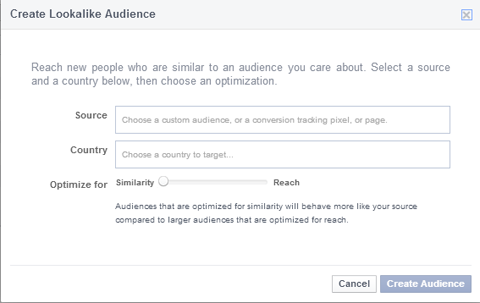 Custom audiences are important to Facebook retargeting campaigns. 1. Go to your Facebook Ads Manager and choose Audience. 2. Click on Create a Custom Audience. 3. Under Website Traffic, select People Visiting Specific Pages. 3. Next to the Visited field, customize the URL elements to match the pages you want to retarget. You don’t have to retarget everyone who visits your website. After you create your personalized custom audience, it’s ready to use. However, keep in mind that it may take a few hours for the new audience to have the final user count. Retargeting to existing Facebook fans is incredibly easy: When you set up your Facebook ad, choose to target people who are already fans of your page. Narrow your retargeting audience to include only people who are fans of your page. Does it seem odd to advertise to existing Facebook fans? Consider that acquiring sales from existing customers is cheaper than acquiring new leads (and many of your fans are probably customers). You can also upsell those existing customers with new or better products and services. Additionally, your fans may not be seeing all of your Facebook updates. If youretarget your most important content to them via a Facebook ad, they’re more likely to see it. You can actually strengthen the power of your newsletter by serving Facebook ads to existing email subscribers. To set up this custom audience, you need an Excel file with a column that includes all of your subscriber email addresses. Once you have that, go to Audiences in your Facebook Ads Manager, click Create Audience and choose Custom Audience. Click on Data File Custom Audience and follow the instructions for the setup. Make sure to indicate that you’re updating email addresses. 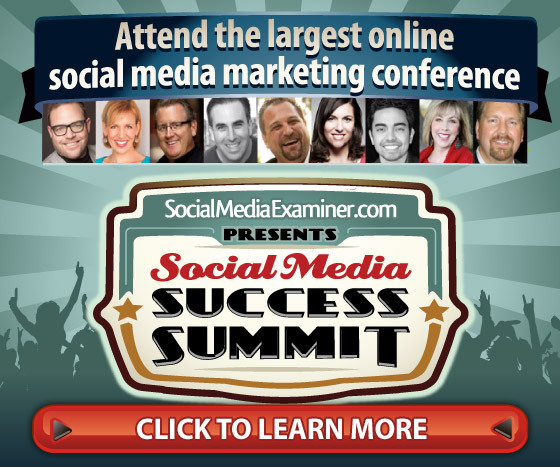 Create a custom audience based on your email subscriber list. Retargeting to email subscribers can increase the chance of conversion exponentially. It’s worth the extra effort to set it all up. Many of your users—whether website visitors, Facebook fans or list subscribers—have overlapping demographics, interests and behaviors. Wouldn’t it be great to find more people like them? Well, you can. You can create a custom audience targeting people who share similar characteristics to your existing connections—people who are very likely to be interested in your products, services and content. The custom audiences you create to retarget to by similarity are called lookalike audiences and they expose your ads to a more vast and relevant audience. To create a custom audience based on similarities to website visitors, go to the Audience section of your Ads Manager and choose the custom audience installed on your website (see #1). Click Create Lookalike Audience at the bottom of the page and choose the desired audience reach. To create a custom audience based similarities to your current Facebook fans’ personal data (e.g., behavior, interests, etc. ), go to the Audience section of your Ads Manager, click Create Audience and choose Lookalike Audience from the menu. Create a lookalike target audience to find potential Facebook fans and customers. Click Source and type your page name. Select the country you want to target and how similar your audience should to be to your current fans. Click Create Audience. Choose the characteristics of your fan page lookalike target audience. To create a custom audience based on similarity to your current email subscribers, go to your Audience menu, click on the name of the email list you loaded in #3 and click on Create Lookalike Audience at the bottom of the page. Once you have your custom lookalike audiences in place, you can select each as needed depending on the goal of your Facebook ads.